The breakdown of compounds by respiration releases much more energy than does the breakdown of the same compounds by fermentation. This is because the complete reduction of the products of fermentation isn’t possible without oxygen or oxygen substitutes to act as terminal electron acceptors. The star of this phenomenon is the electron transport chain, which involves several electron acceptors positioned within a membrane in order of reducing power so that the weakest electron acceptors are at one end of the chain and the strongest electron acceptors are at the other end. It’s the specific orientation of electron carriers in the membrane that creates the proton motive force and links ATP synthesis with it. The electron transport chain reduces organic compounds to CO2 and conserves some of the energy as electrons are transferred from the carbon substrate (glucose), through several redox reactions to the terminal electron acceptor (O2). Some membrane-bound carriers, like the quinones, are nonprotein molecules, but most are oxidation-reduction enzymes and some of these have prosthetic groups that participate in redox reactions. Prosthetic groups are small molecules that are permanently bound to an enzyme and are important to its activity. NADH dehydrogenases: These are proteins that accept an electron (e–) and a proton (H+) from NADH, oxidizing it to NAD+ and passing them onto a flavoprotein. Flavoproteins: These are made up of a protein bound to a prosthetic group called flavin, which comes from the vitamin riboflavin. The flavin group accepts two e– and two H+ but only donates two e– when oxidized. Cytochromes: These proteins contain a heme prosthetic group with an iron atom in its center that gains or loses a single e–. There are different classes of cytochromes based on the type of heme they contain and labeled with a different letter (for example, cytochrome a). When the same class of cytochrome is slightly different in two organisms, each gets a number attached to the name (for example, cytochromes a1 and a2). Iron-sulfur proteins: These bind iron but without a heme group. Instead, they have clusters of sulfur and iron atoms arranged in the center of the protein. They only accept e– and have a range of reducing power depending on the number of iron and sulfur atoms present. Quinones: These hydrophobic molecules (not proteins) are free to move around the membrane. 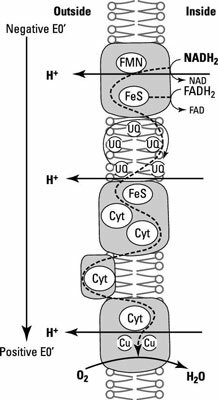 They accept two e– and two H+ and usually act as a link between iron-sulfur proteins and cytochromes. Here, you can see examples of some of these compounds and how they’re physically sitting within the membrane in the right order for electrons to flow from the most electronegative to the most electropositive.